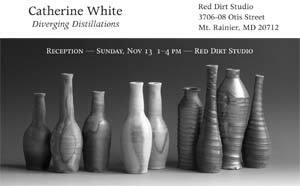 This exhibit is in conjunction with Margaret Boozer's open studio in Mt. Rainer, Maryland. The exhibit is open [by appointment] from Nov 4th through Nov 13th. ; please schedule before visiting. 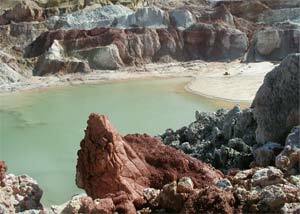 An exhibit at the Stancills clay mine in a gallery dug right into the earth. 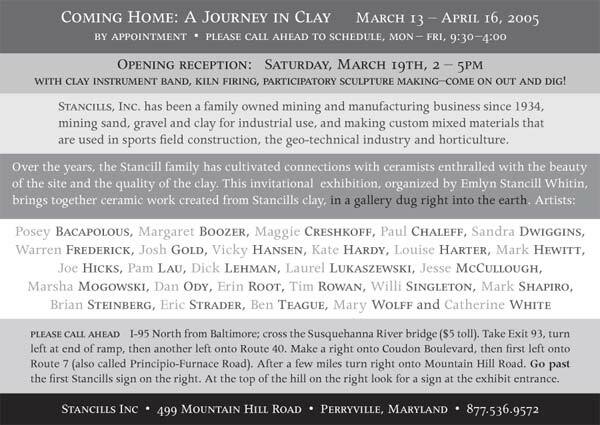 More than 27 artists who have used Stancills clay to make pottery and sculpture. In Perryville, MD, north of Baltimore, being held in conjunction with NCECA in Baltimore. Veins of Inspiration -- thoughts on the exhibit by Catherine White, along with a few more photos of the mine. 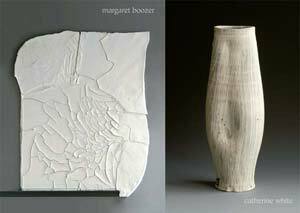 Boozer and White's joint exhibit presents two distinctly different geologic representations of the expressive nature of clay. 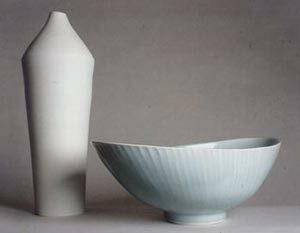 White works on the fringes of our common ideas about what pottery should look like. Making vases, bowls, and plates, her pottery is functional, yet strikes a nuanced, discordant note that separates each object from just being a modern rendition of a past classic. 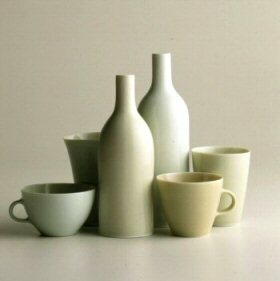 White's light-colored clay is coated in an irregular white slip with a thin celadon glaze while her dark clays are glazed only by the anagama's directed wood ash patterns. Boozer's approach is both painterly and sculptural, each work a manifestation of her gaze focused upon the forces of nature and time. Made by initially pouring out a wet clay slurry on a horizontal surface, each sculpture dries, cracking as it shrinks, tensioned between responsiveness and resistance to artistic manipulation. 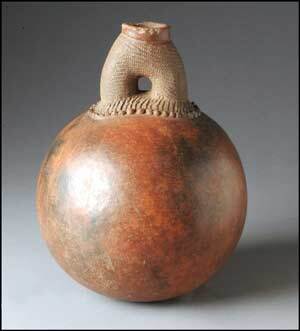 Both artists appreciate-if not gorge upon-the physical personality of clay, playing to seize a tension between the predictable and unpredictable. 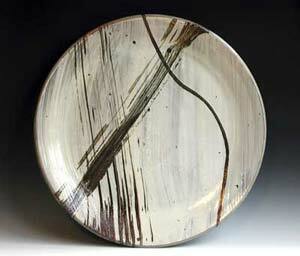 For aesthetic ends, they seek the shrinkage, the cracks, and the changes in color created through drying and firing. 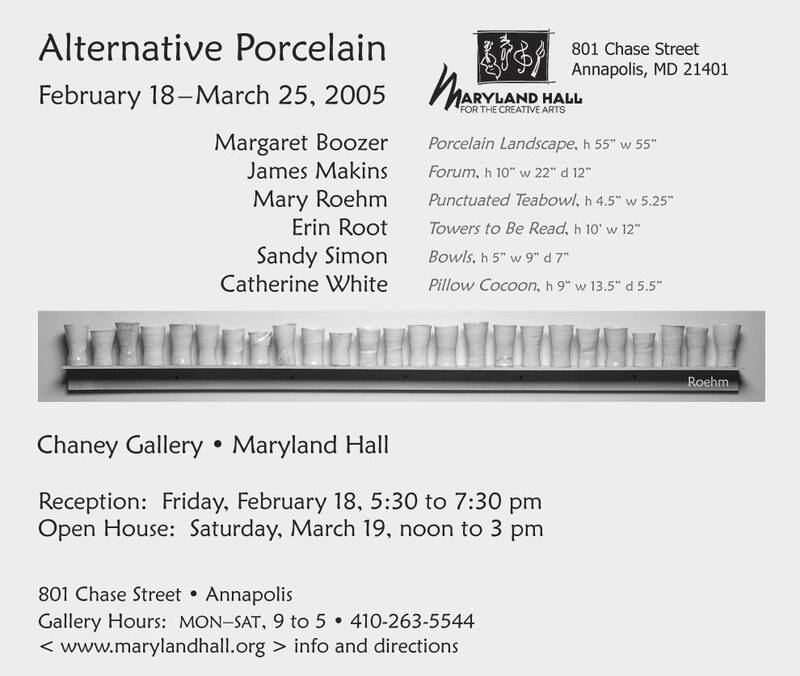 An exhibit of six artists who use porcelain with distinctive touches, yet all of whom expressively oppose the association of porcelain with white, formal ware. Avoiding pat answers, these artists have evolved approaches to porcelain form that seek meaning and feeling in the collision of the precise with the organic. 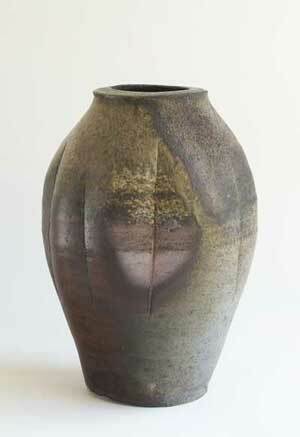 Unpredictability in forming, drying or firing or the border between opacity and translucency all become artistic fodder. 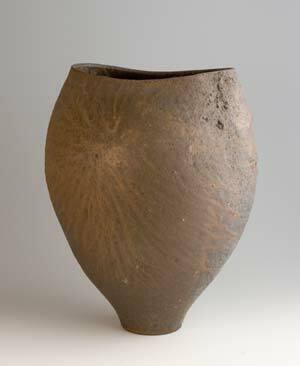 Each artist defines his or her relation to ceramic tradition and production differently. 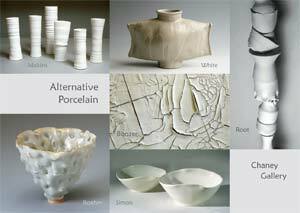 Yet each object manifests an alternative tension between porcelain as a roughened, paltry material or a princely substance. 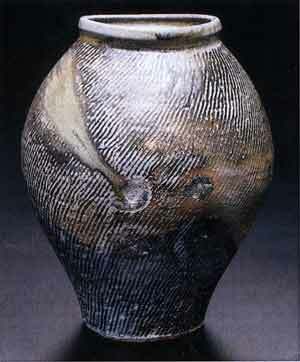 In conjunction with the National Council for Education in the Ceramic Arts 2005 conference, Kenneth Trapp curates this unique invitational. 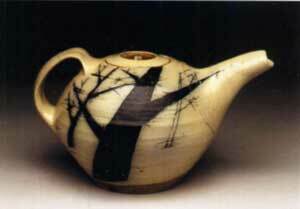 Showcasing thirteen Washington area ceramic artists, the exhibition demonstrates the range of artistic styles and techniques present in this area. 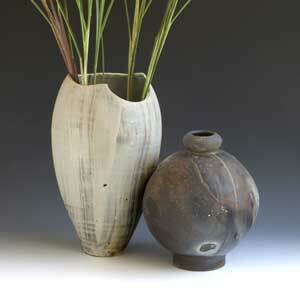 An exhibit featuring twenty women in clay from across the country, curated by Kevin Hluch. 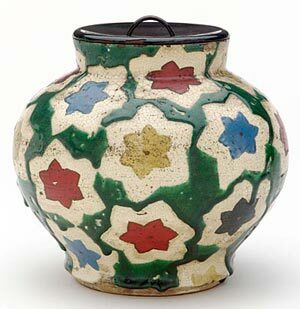 Dawson's major exhibition of African ceramics was held in March/April. The website has an inspiring set of (39) images. The printed catalog with 50 color photographs includes two essays: one by Barbara Thompson, curator at the Hood Museum of Art, Dartmouth College, Unearthing the Buried Identities of African Ceramic Artists. 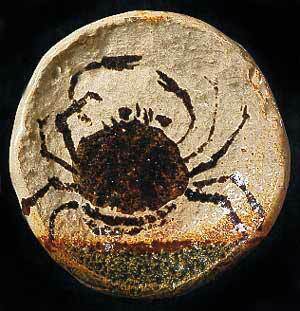 The other essay is by Warren Frederick [of Artistpotters], The Inescapable, Indivisible Essence of Pottery. An exciting exhibit of Noguchi's work in clay, both sculptural and functional, some created during visits to Japan in 1931 and 1950, but mostly made while living at Rosanjin's compound in 1952. The exhibit also focuses on Japanese ceramic artists such as Kazuo YAGI, ROSANJIN, and Toyo KANESHIGE as they tussled with sources of artistic and ceramic inspiration in the 1950's.zuo YAGI's seminal work is featured in the exhibit. ArtistPotters will be making several of Yagi's articles available. Look for the slide show under past exhibitions on the website. "The brilliant designs on pottery vessels issuing from the workshop of Japanese artist Ogata Kenzan (1663–1743), including mountain landscapes, showers of multicolored maple leaves, famous scenes from classical Japanese poetry, and bright concentric circles modeled after a child's toy top, captivated an audience of wealthy merchants who showcased the witty, colorful works in their reception rooms, studies, and tea-ceremony huts. The Kenzan style, which incorporates images from literature, painting, crafts, and ceramics, was popular during the artist's lifetime, as one eighteenth-century Kyoto guidebook deemed 'Kenzan ware' an indispensable souvenir, and continues to be a distinctive mode of Japanese ceramics today." 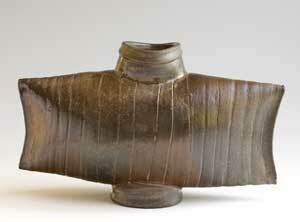 Shimaoka, known for his rope-impressed surfaces, was named a "Living National Treasure" in 1996. There is a short article by Rupert Faulkner (in conjunction with an exhibit at Galerie Besson with 16 website images) as to why Shimaoka's work is not mingei, but is the product of ideas. The current issue of Studio Potter is also devoted to Shimaoka; it includes the text of the talk Shimaoka gave at the JICC opening. Shimaoka will be 82 years old in October. Eleven years ago he wrote an essay titled, "My Work in the Next Years" which stated, "I would like to keep the same basic attitude in my work, but within these limits, I hope to do work that is more selfish and unrestrained." 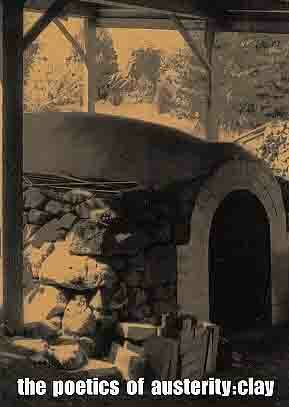 and Warren Frederick, with a (postcard) background image of the White-Frederick kiln. There are two exhibits this month. 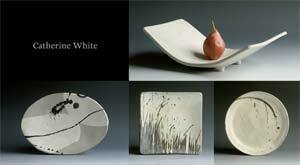 First there is selected work from White and Frederick's April anagama firing. 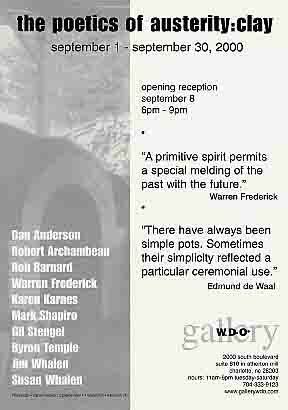 Then, there is a look back to 1995 at Rob Barnard's 20-year retrospective exhibit. This show was sponsored by the Sasakawa Peace Foundation in Washington, DC. The catalog included a statement by Barnard and an essay by the curator, Jane Addams Allen. 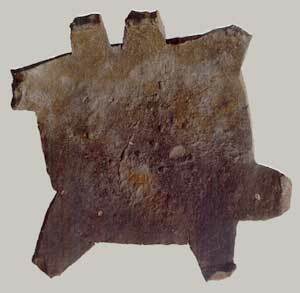 We plan to take advantage of the Internet's ability to quickly assemble and to conveniently reach an audience that in person, has little opportunity to read about or to see provocative exhibits of pottery. Yes, we know that touching is everything, but if there is little or nothing to handle, there is much value in merely seeing. 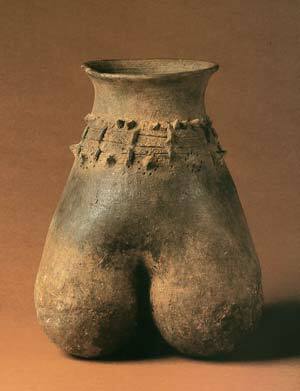 You'll find that "provocative" here doesn't mean turning pottery into non-physically useable vessels; it does mean arguing for the austere. We'll be providing some exhibits on individual artists as well as a focus on particular forms; perhaps the under-appreciated cup; storage jars; and vases for weed-flowers. 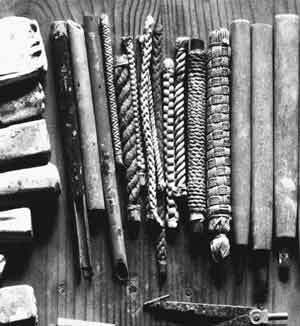 We will be adding some articles on the practical uses and abuses of history and on the problems and potentials of craft. Please check back and provide your comments as we get up to speed. Thanks!